After an exterior staining project with TWP, Total Wood Preservative Stain you may have some extra left over. Or you may have bought some TWP wood stain intending to use it and just haven’t got around to it. Whether you have some left over or the season ended before you could use it, TWP wood stain will store and keep fresh with proper care. 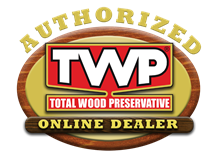 TWP Wood Preservative has a shelf life of several years if it has been unopened. So if you ran out of time at the end of the season do not worry, you can still use it when you are ready. If the TWP stain has sat around a while, it is recommended to take the stain to a paint store and have them shake the cans up before using them. If you used TWP stain and have some left over, the extra will last 1-2 years as long as the lid is completely resealed. If the lid is not sealed properly evaporation of the stain solvents will occur and the stain will become thicker and be rendered useless. Be sure the lid is completely sealed to stop any evaporation from happening. This will ensure the left over TWP can be used on your next wood maintenance project. When storing TWP stain it is best to keep it in a cool dry place preferably at room temperature. It should be kept out of direct sunlight if possible. Oil based stains like TWP can be stored in colder weather and in some instances even below freezing. The oil formula will simply thicken, unlike water-based stains that would actually freeze solid. With that said if you have a choice and can bring the stain into the basement or partially heated garage for the winter that would be best. If you have several partial cans of TWP stain it is best to combine them to make a full can. The less empty space in the can the better. Air above the stain will cause a skin or gel to form on the surface. This can be removed but it is better to have one full can and just a little left in another than to have two partially half full cans of TWP stain. Be sure the lid is on tight to eliminate the solvents from evaporating. As soon as you finish a project it is helpful to mark on the lid what you used the TWP stain for. This way when you use the stain a year or two later you won’t have to guess. Follow these storage tips to increase the shelf life of your TWP wood and deck stains and they will last for several years saving you money. Is my resealed 5 Gallon 1500 Stain still good after 1 year? I hammer the tabs down really well around the entire thing. It was stored in basement that doesn’t get too cold. I think when tipped it that it didn’t leak at all so thought seal was good. I haven’t opened it yet but hoped to use it soon for a new coat this year. Is it still good? How will I know? If it has thickened up, skinned, or has thick clumps, it has gone bad. You can transfer it to a plastic pail/lid. You can get those at your local store. It’s not quite that simple. Just prying the tabs doesn’t work. I had to use heavy plyers and pry the tabs back to 90 degrees of the pail…..but I got it and appreciate your reply. Pry the tabs back with a screwdriver. Is there a mildewcide that could enhance TWP 1501 Cedartone stain? Replaced the product the builder had used on Cedar Screen porch with cement pad 6 summers ago with TWP 1501 Cedartone 3 years ago. Results less mildew with the TWP but still shows mildew. There is already an EPA registered mildewcide in the TWP. Adding more would not help and could have issues. We are going to be putting up New Cedar siding on our home. The cedar is tight knot smooth dried cedar siding. Because it is dried can we put two coats on. We were thinking on dipping the wood and then once its up put another coat on the outside. Is this possible with the TWP? What is the consistency supposed to be? We just reopened a gallon can of the 100 series that had been stored in a closet for a couple months and it seems really watery. We just want to make sure that is correct before we go using it. Thin and consistent similar to water is correct. Make sure it does not have any skinning on the surface or clumps. Is there a trick to opening and closing the 100 series 5 gallon bucket? I had a heck of time getting it open and now that my project is done, I want to make sure I seal it properly so I can reuse when needed. Is there a special tool to use? The 5 gallon containers cannot be closed 100% after opening and when done. If you have any leftover stain, best to transfer this to a small container(s). You can purchase small one gallon containers at your local hardware store. Will I have to restain my fence within six years if I use TWP 1500 stain? 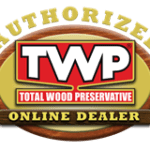 On vertical wood, TWP typically lasts about 4-6 years. I just purchased 2 gal. Of TWP 101 ceder stain the dealer told me he had shaken can to mix but when I opened can all color was at bottom. I only have paint stir sticks and it is almost impossible to get color from bottom of can to mix ??? With the stir sticks or a drill mixer will work. If the lid is on tight and doesn’t leak store the can upside down (Lid on the bottom). Nothing can evaporate through a fully sealed can. It is an old trick many plumbers use for their leftover epoxy and cements. Helps things last years and ensures it will always be ready when you need it! I stained my pressure treated wooden deck with 1515 Honeytone in 2012. Love it!!! Can I put another coat on this year without stripping it?? If so what would the prep process be? Yes but you will need to prep first with the Gemini Restore Kit first and you may need two coats since it has been 3 years. I have stored some TWP 100 for 2 years, a 5 gallon pail 1/2 full. It has thickened some about the consistency of an interior latex paint. After thoroughly mixing I have stained a small section of cedar siding, it looks good, but should I be concerned with the change of viscosity? It is no longer good at this point. What is the shelf life of an never-opened gallon can of TWP 100? Should it be shaken? Yes it needs to be shaken or stirred well. 2 to 3 years if unopened. Can TWP 100 stain be stored in plastic containers such as an old hydraulic oil 5 gallon bucket? The seal on my metal lid is deformed and I’m concerned it is not sealing completely. The buckets for the oil have been cleaned and have a good sealing lid.